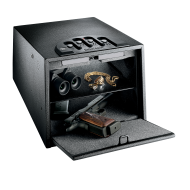 The GunVault GV1000DLX pistol safe is designed for multiple usages. Its tapered body and end door, make it the perfect pistol safe for under a vehicle seat. It is pre-drilled for bolt down or can be used with a security cable. 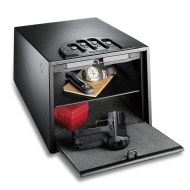 This pistol safe is easy to use for many things besides handgun storage. Keep your credit cards or cell phone in it at a resort. It has a sturdy steel construction with a foam lined interior that will cushion your jewelry or watch. Because this is the Deluxe model it has many extra features such as a light that comes on automatically so you can see the contents clearly. 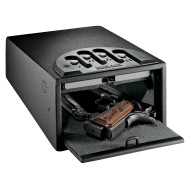 The exterior of this handgun safe is constructed of 16-gauge steel, while soft foam on the inside protects valuables. 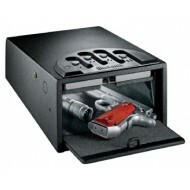 The GunVault 2000S handgun safe is a perfect way to secure two or more pistols and other small valuables. 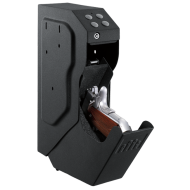 With the "no-eyes" touch keypad and spring loaded door, the GunVault 2000S is the perfect way to gain quick access when you need it most. The high strength locking mechanism performs reliably time after time, and the precise fitting of the door makes it virtually impossible to pry open this handgun safe. It is powered by one 9V battery and has a key override if the batteries fail. This unit is a California Department of Justice approved handgun safe. This safe has been tested and proven its ability to stand up against light attack. If you want a quick and reliable product, this is the correct handgun safe for you. Keep your handgun safe, secure and ready for action with the SpeedVault. Offering a revolutionary design, the SpeedVault is equally as fast as it is discreet. It is the ideal choice for a home or business looking for added security. The electronic key pad operates with one 9 volt battery. There is an LED display the will light as a low battery warning. The SpeedVault comes with an over-ride key. This is a strongly built small pistol safe with solid 18 gauge steel construction. Precise fittings are virtually impossible to pry open with hand tools. The electronic lock is easy to use and to program. You may be able to store your Ipad or other tablet in this safe. Included is a high strength steel security cable. 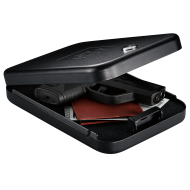 The GunVault pistol case offers solid construction of 16-gauge steel with a soft foam interior. 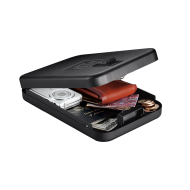 The GunVault pistol case has a high-strength lock mechanism and an easy-to-use key pad. 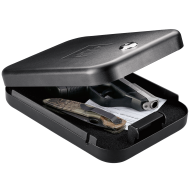 GunVault offers easy portability and quick access. The pistol case is pre-drilled for lock down or you can use an optional high security cable. 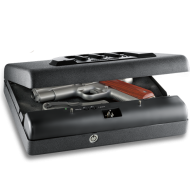 Tapered to fit under a vehicle seat, the GunVault pistol case is one of the few products out there that opens at the end so your hand gun can be easy to reach but out of sight.